Fimware Upater V 1.0 error. I have purchased 3 cactus V6 units and am trying to update to the latest firmware (1.0.175) and Windows does not recognize the unit. I have downloaded the .zip file for Windows on 2 different computers, one Win95 and the other Win7. After the Firmware Updater ver 1.0 was installed I restarted each computer. I open the Updater program and I plug in the Cactus V6 unit to a USB port on the computer. Then, while holding the "MENU" button I switch on the Cactus V6 to either the TX or RX mode. I continue to hold the "Menu" button and the red light flashes on the V6 and the following message appears on either Windows version: "USB DEVICE NOT RECOGNIZED One of the USB devices attached to the computer has malfunctioned and Windows does not recognize it. For assistance in solving this problem click this message." Of course clicking on the message provides no help in either Windows version. I have tried all 3 V6 units with the same failure messages. I have also tried all available USB ports on both computers. It seems that there is a malfunction in the Firmware Updater. If you do not have any other suggestions all 3 units will require to be returned to the dealer. Thank you for your feedback. I'm sorry to hear your updater didn't work on your Windows. I hope this is helpful. Let me know if that works, We will respond as quick as we can. "USB DEVICE NOT RECOGNIZED One of the USB devices attached to the computer has malfunctioned and Windows does not recognize it. For assistance in solving this problem click this message." With the Firmware Updater V1.11 you should hopefully not experience this anymore. In case you still do and you are keen to make it work, it should be possible. The above message indicates that the device driver was not installed and there is a relatively straightforward way to install the device driver manually. Again, hopefully everything will work automatically, but if not and you'd like to give it a go, please just let me know and I'll post instructions. Thanks for the help so far, I will try the V1.11 of the updater and let you know if it solved the problem. "This will install Cactus firmware 1.0 on your computer." the computer has malfunctioned and Windows does not recognize it. For assistance in solving this problem click this message." Since the updater is packed in a zip file. Whenever the file is unzipped, the files are temporarily saved in the cache. That may lead to the problem that the installation file always stay at V1.0. To solve that, we have renamed to the file to setup_1.11.exe . Please download the updater and try again. The interface of V1.11 look like the attached picture. Hopefully everything will work. Please give it a try. Next time you are successful to have a V6 recognised, try the "Check for latest firmware" button first and select the latest firmware before you click on "UPDATE". Again, if you cannot make it work with the new setup file, I'd be happy to try explaining how you can install the device driver manually. You basically just need to locate the "CACTUS_V6.inf" file in the Firmware Updater "drivers" directory, right-click on it and select "install". This should install the driver and make the Updater work for you. I will give the above link another try today. I have also reached out to the dealer that I purchased it from and they said they will call Cactus directly themselves as Cactus has no toll free number (bad for business) for consumers and it would cost me $2.49 per min to call Hong Kong. @Class A Why do you feel that clicking on "Check for latest firmware" BEFORE "UPDATE" might be hindering things? All 3 of the V6"s are not up to date. I didn't say it would be "hindering things". I suggested to check for the latest updates first so that you can select the latest one. Otherwise you'll probably be getting the one that comes with the updater. Perhaps that was the reason that you got V1.0.152 after the update. More likely, though, your update that appeared to work, did not really work. Give the updater link posted here a try. If it doesn't work, try to install the driver manually (the way I described in my previous post). I first uninstalled the Updater that was installed on Win7 and all of its components. I then installed http://www.cactus-image.com/cactus_updater.zip (" we have renamed to the file to setup_1.11.exe"
During the installation process...yet again...the dialog box stated: "Welcome to the Cactus Firmware Updater Setup Wizard. This will install Cactus Firmware Updater 1.0 on your computer...."
I just tried to download the file myself and can confirm that it announces to install version 1.0. Is it just the info message that needs updating or is it the wrong file? Where is your Firmware Updater installed? Unless you specified a different location during install, it should be at "C:\Program Files\". Can you go there and try to locate a "Cactus" or "Firmware Updater" directory? Instead of locating the installer directory, you could just search for the file "CACTUS_V6.inf" (it is in the "drivers" directory of the updater directory). Once you see the file, right-click on it and choose "Install". This should install the device driver. Now you can try to run the updater again. Perhaps this will get you going while Cactus are working on trying to find out how to address issues such as yours in an automatic manner. 2. I'm done trying to piece this together. It should work correctly "out of the box" with no Mickey Mouse efforts. I'm glad the Win computer does not have 8 installed on it...what a nightmare. I have Garmin GPS updater, Updater for my home theater AVR, easy update for my DSLR, radio scanner, electronic flashes etc. and have never had to do any modification and/or hunting for this file or that file. 3. My first clue that this was not a great choice was that Mac was not supported. 4. Called the dealer today, who tried to get in touch with Cactus themselves but said he did not have any luck. and explained what attempts we were doing here and mentioned if the last link that was provided above did not work, I would be returning the units on Monday. They understood and will be expecting to get them back. Thank you for your efforts anyway. It should work correctly "out of the box" with no Mickey Mouse efforts. I'm glad the Win computer does not have 8 installed on it...what a nightmare. I have Garmin GPS updater, Updater for my home theater AVR, easy update for my DSLR, radio scanner, electronic flashes etc. and have never had to do any modification and/or hunting for this file or that file. Well, it does work out of the box. For practically everyone, it seems; I have not read about any Firmware Updater problems before. Please note that I only gave you an option to solve the problem manually because I had the same issue as you did with the very first installer I ever tried (this was during beta testing; it was a protoype installer and I installed it in a non-standard location). It took all but 1 minute to fix the issue. No one would be expected to do this. What your specific issue is, I don't know, but something odd is going on because later versions of the firmware updater were completely trouble free for me and as I said I have never heard anyone else mention the issue you had. Too bad it did not work for you as well. Captmike said: During the installation process...yet again...the dialog box stated: "Welcome to the Cactus Firmware Updater Setup Wizard. This will install Cactus Firmware Updater 1.0 on your computer...."
Can you link me the screen capture of what you've seem about the error? I'm sorry but I am not going to put anymore time into this issue. As mentioned above, I will be returned to the dealer on Monday. I can confirm that installing "setup_1.11.exe" will result in the message " This will install Cactus Firmware Updater 1.0 on your computer.". So either that message is wrong or it is indeed an old version of the installer. Regarding the error Captmike saw during attempts to use the upgrader, it is most likely that the drivers were not installed (for whatevever reason). I'm pretty sure that my suggested steps to fix the problem would have resulted in a working updater. I am encountering this same issue. I am running Win7 and I installed the firmware updater. When I first installed there were warnings regarding the unsigned drivers. I clicked for the system to install them anyway. 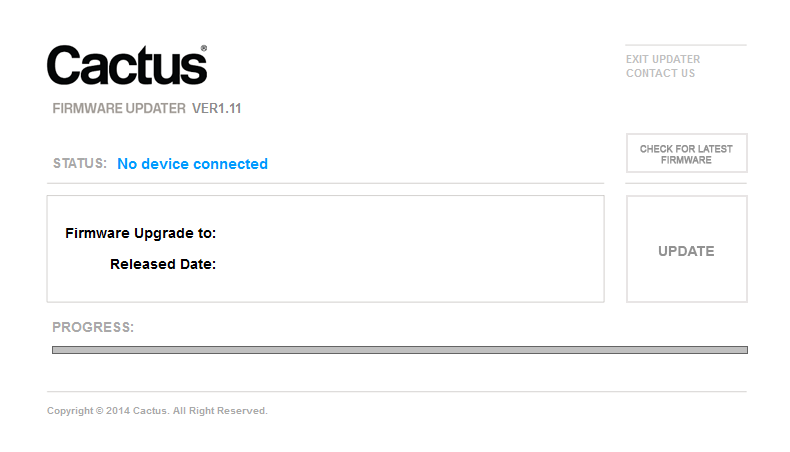 I have connected the cactus v6 with a standard mini USB cable and put it into the mode to update the firmware. My system does not detect the device however. I attempted to install the inf file as you noted above and my system said that this was not allowed. I am not able to update the firmware. Your assistance is required. Did you have anti-virus program on running during the installation? It may block the updater to install the V6 driver on the Win 7. Please switch it off and try again. My antivirus is disabled. Is there a way that I can just install the drivers separately? When I plug in the CACTUS V6 it does not get recognized by the PC so I assume this is an issue with drivers. I attempted to install the inf file as you noted above and my system said that this was not allowed. I'm assuming that whatever is stopping your from installing the drivers manually (through the .inf file) is also preventing the automatic installation. Perhaps you need administrator rights and either need to just grant them, or log in as a user with administrator rights. "the INF file you selected does not support this method of installation"
And all I have is a close button. I tried to install your software on an XP machine and it doesn't detect the device either. Does this require a specific USB cable or any generic USB cable should work. I finally found a different micro-usb cable to use and it can now see the device. Exactly same problem here. With the difference that I try 3 different cables and still dont work. Is there any cable specification that we need?? I ask for a new cable in the office and it worked. This is kind of random, I bet there is some specification in the cables, or at least one cable quality standart. Now I have other problem, I gonna make a new post. There is a type of USB cable designed for power charging only. There is not data connection. I guess that could be the reason why you couldn't get it work before.